Thread: SmokinStang's - Project: "PULNGZ"
ATTN: SmokinStang.com Members: I have "Stickied" this Thread to Serve as Reference of a "Digital Storybook" only. This is one of my Stangs......and I endorse & hope that other Members do the same!!! This site is all about the Members & the "Safe Keeping" of such Digital Content for future Reference. I truly enjoy sharing the Passion, and hope you do to. We all can't be doing projects all the time to our Mustangs, so it's great to share in with others that are. It feeds the fire......as we all are Mustang Junkies!!! 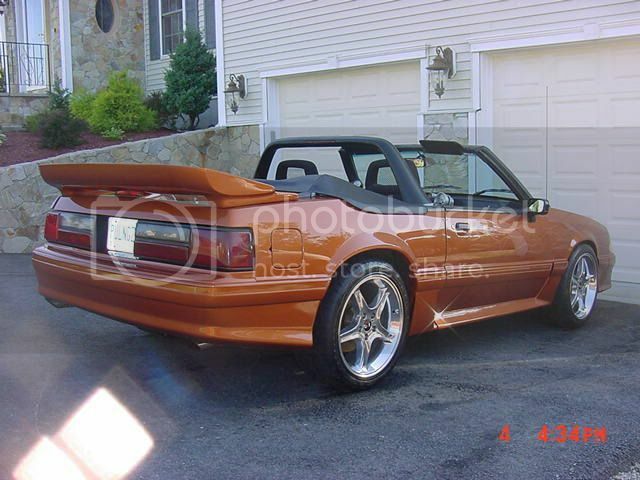 My intention with this car/project was to build myself an extremely well rounded street sports car. 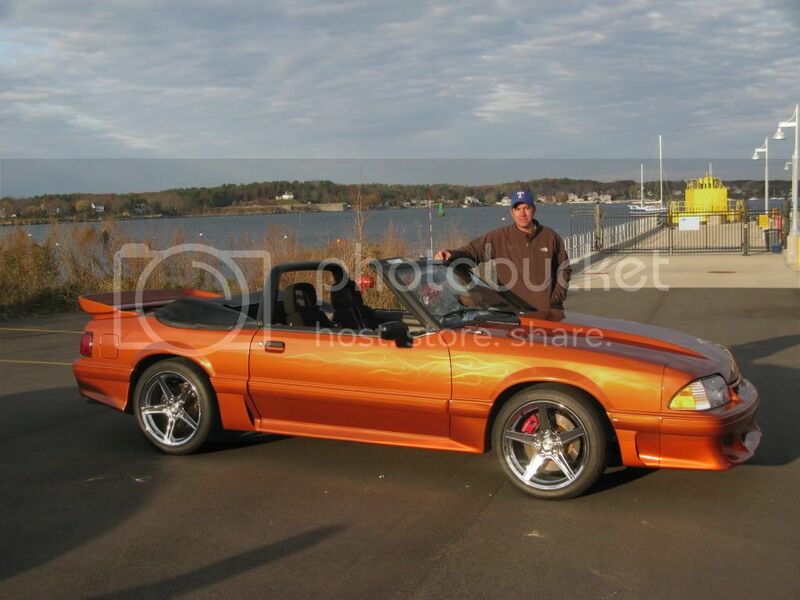 Owning several Mustangs in the past, and now currently owning two (the 2nd is a "3P" - Pre-Production 2007 Vista Blue Shelby GT500 Convertible), I knew that the foxbody was the Mustang of choice resulting from the fact that I feel "right at home" and completely comfortable piloting it from behind the wheel. I needed power, reliability, safety and great handling, all packaged in a mature, clean finish, that offered a hint Uniqueness. Now that I'm in my late 30's, I knew that it would have to select my exterior choices wisely.....especially the COLOR. I purchased the car originally off ebay from a guy in Ohio. 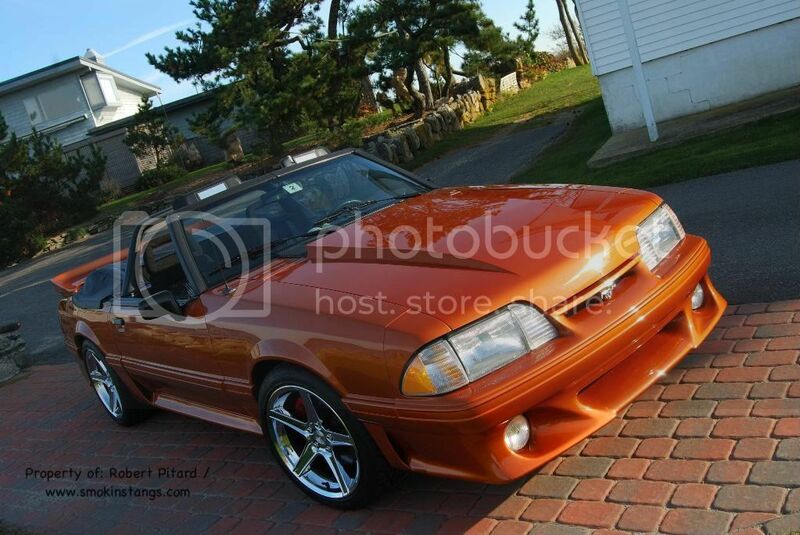 It was originally Vermillion Red, which I liked, but it was extremely faded as a result of the poor single stage paint. Paint was the least of my concerns at that point, as I have a good AutoBody Shop friend. 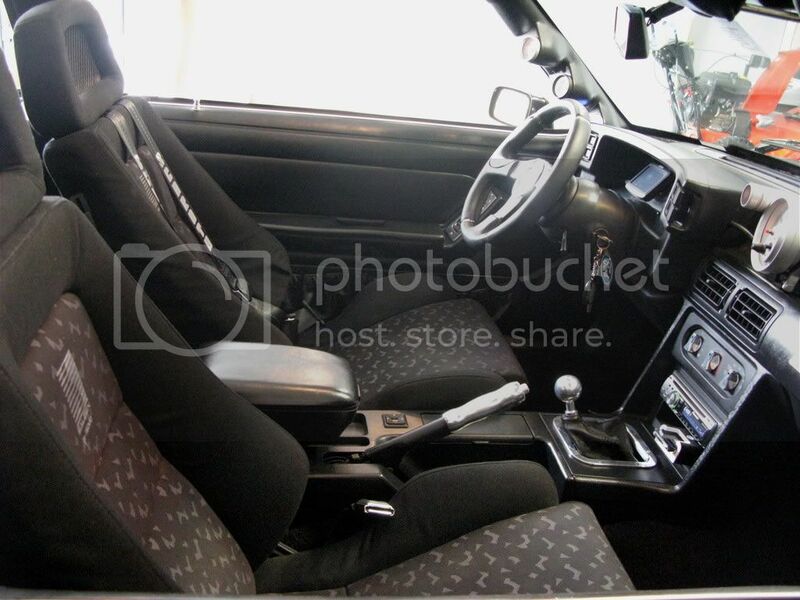 I purchased the car for the clean, solid body, coupled with the fact that it was a convertible, and it was a 5-speed. It also had a decent list of quality speed goodies, along with Saleen rims and a full Saleen interior that included Recaro Flo-Fit seats. Having a good friend of mine that owns an autobody shop was key to this project. I knew I wanted to be hands-on for this one, even though during dis-assembly I honestly felt that I had made a major mistake, with all the body either scuffed, sanded, and/or completely removed. 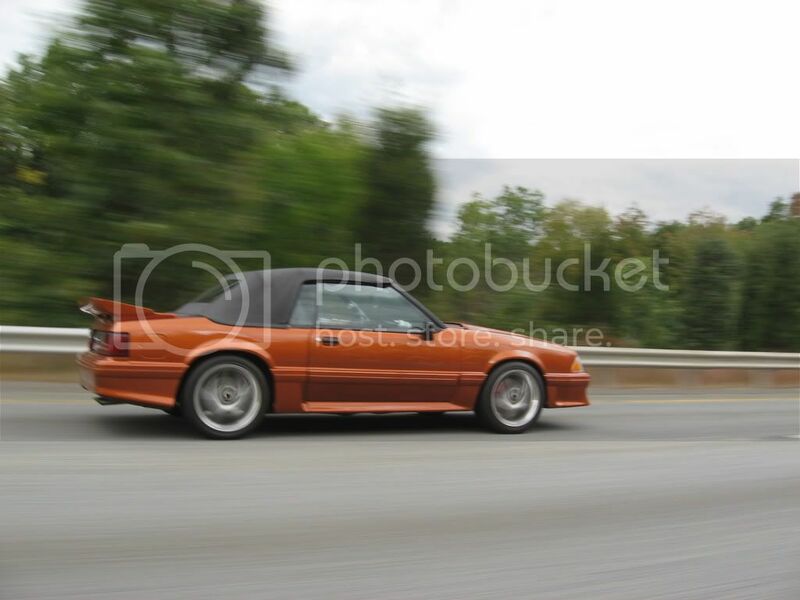 Not being a body man, I always thought that a Fox body in the world of cars, would be pretty easy to work on, well I was wrong. The lines on the Fox and getting them just right turned out to be quite a chore! It was very satisfying thought, as time progressed and PULNGZ was coming back together. Did I happen to say what a dirty and laborious job it is being an auto body guy....kudos to you guys. As we got closer and closer I new I was going to have to make my final color choice. I was toying with either going with Vermillion Red, Performance Red, Ferrari Red, and the coveted "Custom Orange." Now I felt a Red was my safe, but Red is everywhere in the world of Mustangs, add in the Police attraction factor, I was slowly sliding away from red....but it was a safe choice.. I called up my buddy and asked him to spray me a sample for further review, as I wondered how it would look on my Fox. He called me later on alerting me to the fact that it was to new and not available? He said he would check further with his contacts. Long story short........we got the recipe for it!!! He shot the sample card, and I hated it, as it looked really dark and very brown. He tried to shoot some clear on it, as that helped a little but not much. Red was starting to look like the default color here. Sean told me that he really liked this color, as he hasn't seen a color this unique in a long time....he also advised me that it was VERY expensive. I slept on the color sample for a bit, and decide to have him mix me enough to spay a test trunk panel. We did that, and I recall him coming out of the spray both with a HUGE smile on his face. He told me he loved it again. I looked at it again, freshly painted and wet......still unsure. It finally dried, and we brought it out in the sun later for review, at which point it totally blew me away, and I loved it! 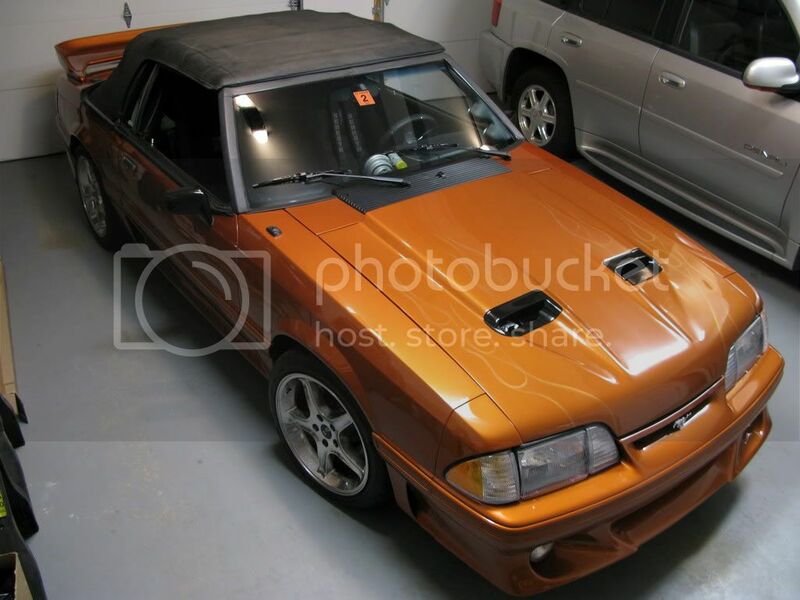 I knew at that moment, we were going Custom Orange!! Now that we had the color selected, I felt that I needed to go one step further, to really make PULNGZ special. 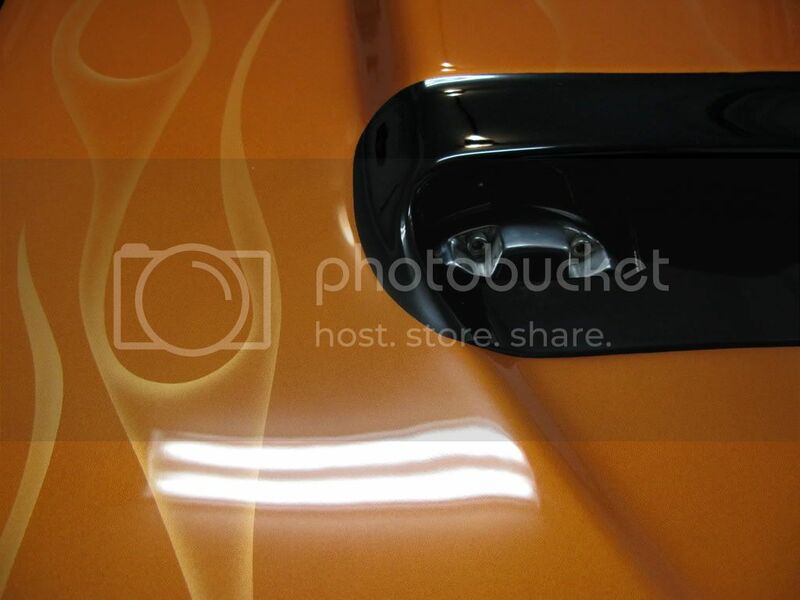 I'm not a huge fan of flames, but when I saw this color applied, I felt flames done...just right could very well work. On-site at Pento & Sons Motorsports works another friend, and long time (30 year) Airbrush - Custom Paint expert (Paul Fitzgerald). I spoke with him in detail, with regard to placement and scale. He quickly drew up several different style flames, as I showed him some examples I had. Together we nailed the final result (although he more than I)! I recall sitting side by side with him as he taped up each lashing, blessing each....Paul some how and intentionally made the lashings similar to the "Tail of the Running Horse Mustang," while I made the final decision on the stopping & starting points. I wanted to make sure the flames appeared to be coming out of the front wheel wells and the engine bay. Sean chose the most perfect Orange/Gold Pearl for the flames. 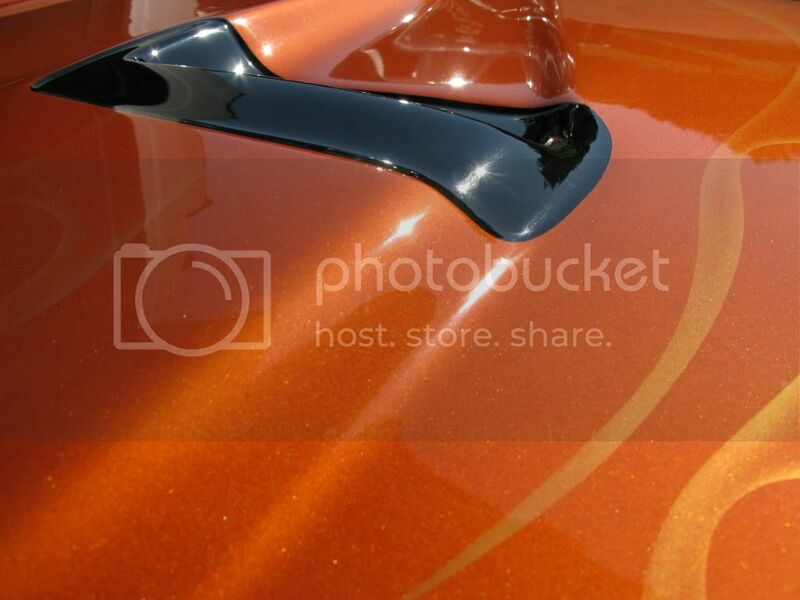 I chose to have the mirrors painted black to hit the car with a subtle 70's flair. The shop surprised me with exterior accent painting of the Ram Air insert area (further adding a 70's flair) as well as under the hood with a painted "R" color keyed. 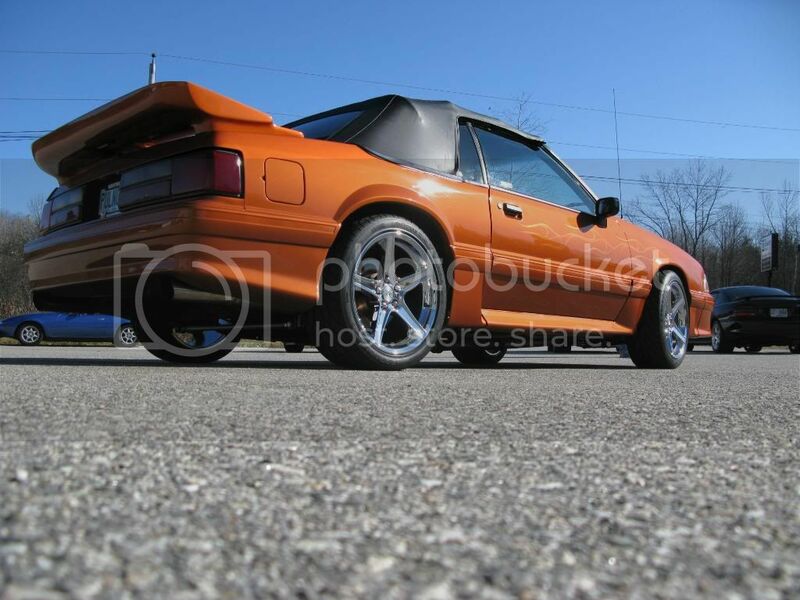 The best clears were applied to finish the paint job, rounding out to what I feel it one of the most stunning combination's for the Foxbody. All I can say is that "PULNGZ" is Smokin!! Prior to the paint process I wanted to get as much of the mechanical work out of the way, to include chassis and suspension. I went through the car, through and through. Replacing/Upgrading many parts right down to a new gas tank. 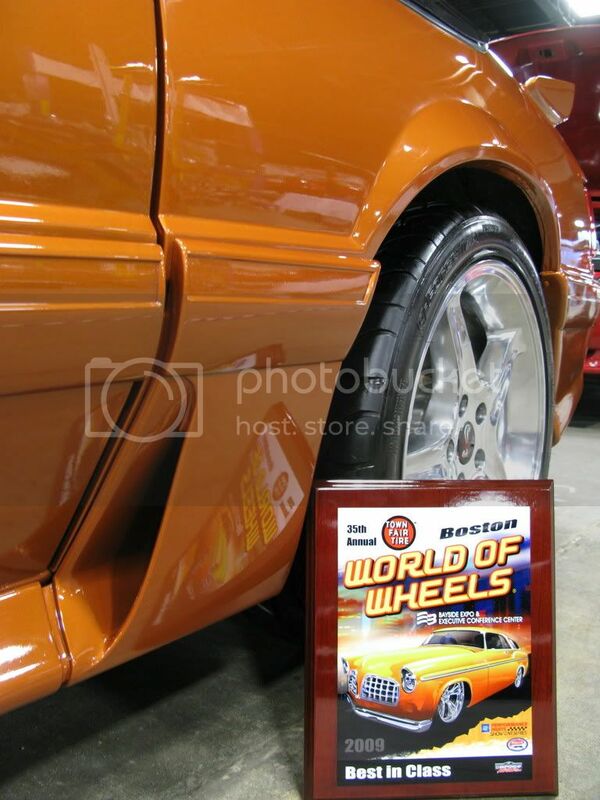 I wanted to stiffening up the car as I knew that the convertible as stock had to much flex. I had Kenny Browns Extreme Matrix Kit welded and painted underneath and also applied a host of Maximum Motorsports components. Knowing that after I bump the engine to my target HP level, the stock braking just won't cut it, I upgraded to all Disc Brakes. Since I was doing the disc brake upgrade, I decided that converting to 5-lug all around, from the stock 4-lug would make sense as I also wanted to apply the 10th Anniversary Cobra Front Calipers (which require a minimum of 17" rims). So now PULNGZ is outfitted with 18" Chrome Saleens and BFGoodrich g-force KDW 2's, mated with the 5-Lug SN95 Rear Disc Brake Conversion, 5-lug front spindles and new brake lines. 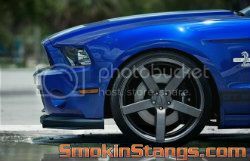 The 18" wheels totally cleaned up the look of PULNGZ, really giving it a fresh, new, late model look. After taken possession of the 92 and driving it a bit. It was time to go threw it. 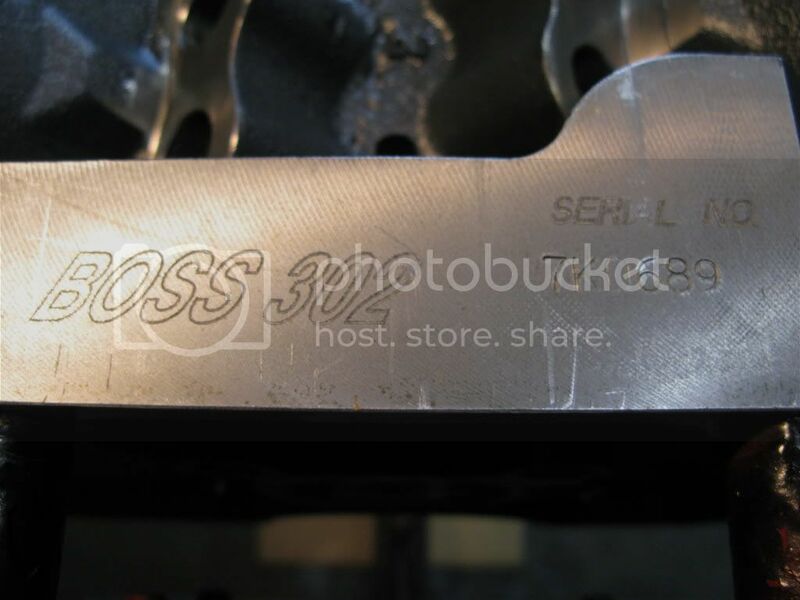 After the engine was gone through, it was clear that it was previously owned by a do-it-yourselfer, backyard, weekend 1/4 mile guy, as the engine was converted from an original Mass Air set-up to Speed Density, all along with a substantial amount of GM small parts. 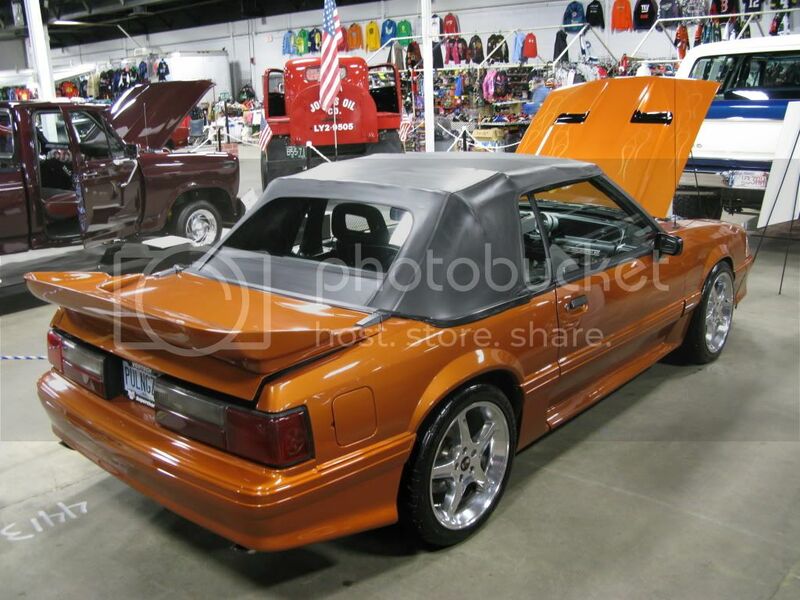 One of my prior mustangs was a 1990 GT that had a re-built engine done by a local engine builder, Bob Pucell of CE (Custom Engine) Racing - AKA:Mondo Bob. I always wanted to have Bob build me another engine, but better than the last (Meaning more power)......so I hired him for this one. Bob Pucell quickly broke down the 302 Mass Air engine in an effort to see what condition it was in. I recall Bob calling it a "Pink Elephant!" Apparently the prior owner was running NOS through it, and it was truly on it's last legs. I opted to have CE Racing build me a new engine for project PULNGZ. We decided that a Supercharged 306, would meet my needs. My target Horsepower was 500. This number was derived directly from my goal to keep up with the new late model Shelby GT500's. The 302 was machined to a 306, and hit with the standard late day accoutrements. All forged innards. A strong Vortech V2_SQ tops it off. The engine is capable of producing 537RWHP with Meth Injection. I recently de-tuned the engine to get better bite to the tires while utilizing 1st & 2nd Gears. Most of the components in the engine bay have been replaced. 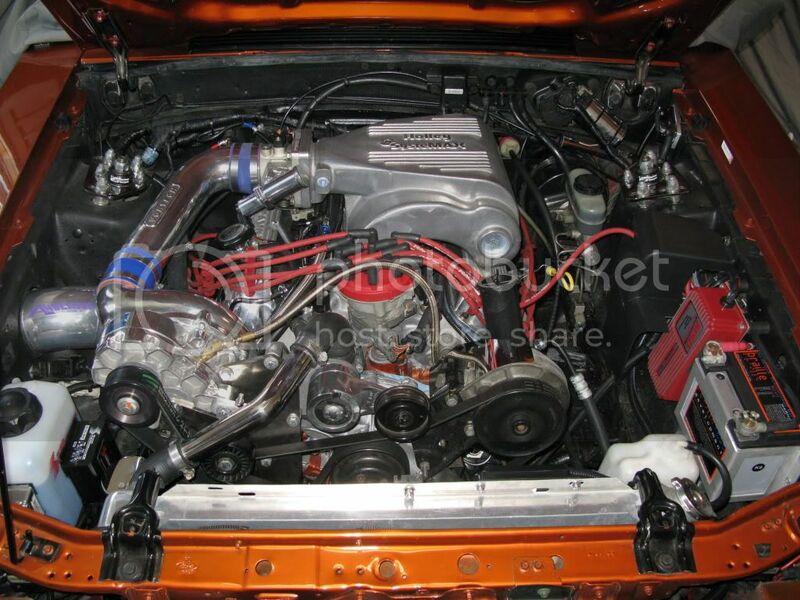 Engine Bay has been Blacked out (flat) for further 70's Muscle effect. Project PULNGZ has been totally restored inside and out. It has an impressive, great pumping Sound System, with customized trunk enclosure (Includes Battery re-locate) even though the engine is truly music to ones ears. Numerous Autometer and Dynojet (Wide-band) gauges keeps me, the driver, informed at all times. 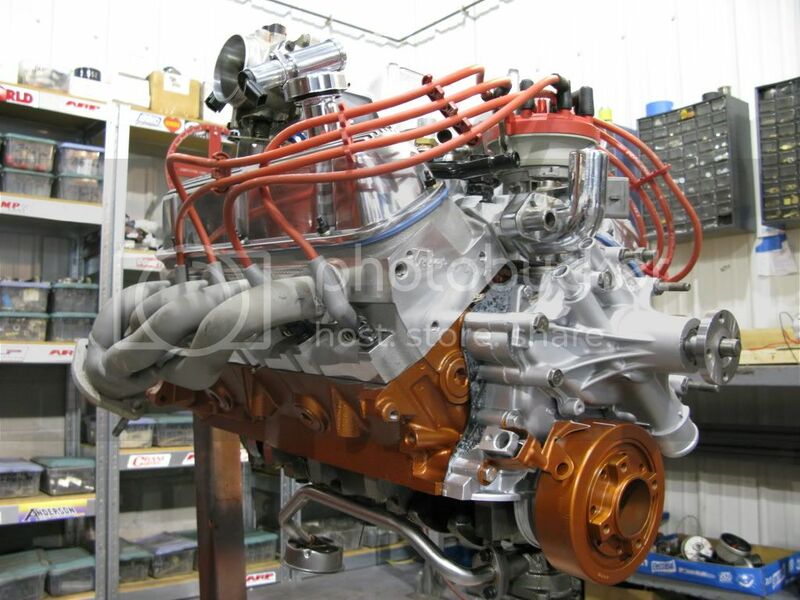 PULNGZ.....has under gone a Heart Transplant and is now powered by Ford's New Boss_302 Block. The engine was built by "Bob Pucell of CE Racing in Milford, MA, machined from a 302 to a 306 by ABT Machine in Holliston, MA, and Super Tuned by Mike DEZ Racing in Seekonk, MA. We all know that these guys are "Key Players" in the Mustang arena for the North East region...............and I will attest that this build Rocks! I'd say that this thing pounds pavement like a Cigarette style Speed Boat pounds water........no lie!! 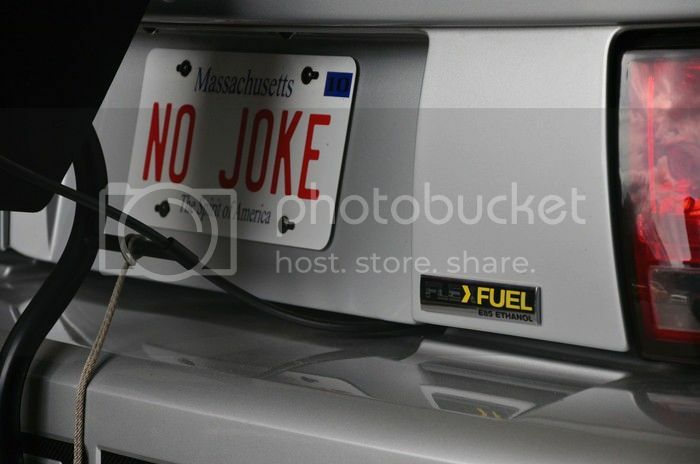 Have since continued changes to Project PULNGZ, by deciding to move the battery back to the from of the car in and effort to aid the electrical systems efficiency. Battery was a Braile model which has a small form factor and must less weight. Re-wired the engine bay. Upgrade to a 200A PA Alternator. Removed & Re-installed new dual electric fan with 2-stage start-up. Also removed the Ram Air Hood and installed a Cowl Induction hood for better airflow and cooling of the engine, as well as reduce hood vibration. Added MM Panhard Bar. Lou's Exhaust redid the exhaust to accommodate latest suspension tweaks. Did a pulley change and installed Electronic Meth Injection system.....basically to just keep "Air Intake Temps" down, not for power. Had Mike Dez of DEZ Racing perform another Super Tune based on most recent changes. Car has MAD Power, and flat out Thumps....all on a Conservative, Super Safe Tune. You have a Porsche too Bob? I didn't know that. Pics? You have done an Exceptional Job on this build Sir. Close-Up of Paint - Smokin Style!! Looking good Bob!!! when did you change out the hood? 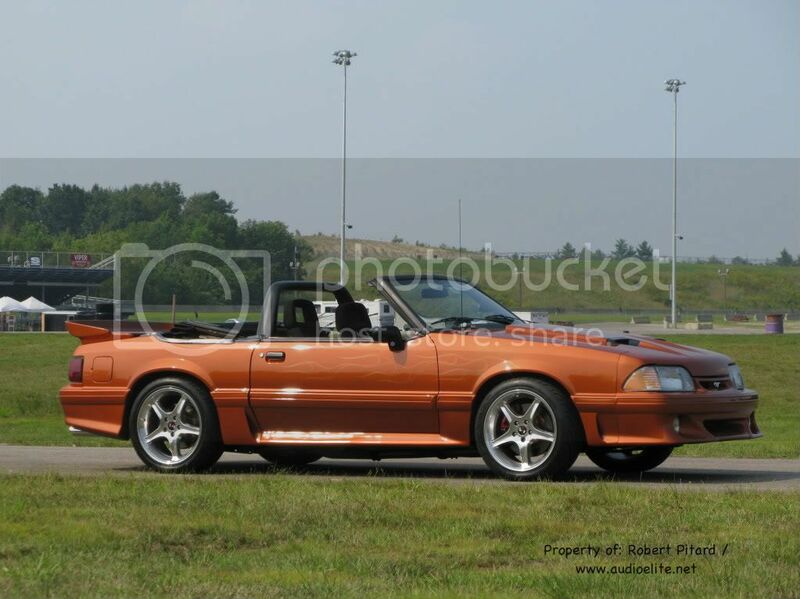 The first , 9 Sec Eaton Only Cobra AND The fastest , Eaton/n2o Cobra on the planet! 9.82 @ 135 w/ a 1.35 - NO Nitrous! 9.46 @ 140 w/ a 1.35 - Nitrous! 9.17 @ 149 w/ a 1.44 <-- ouch!